10th May 2011 in Blog, News. I managed to set up all the photography equipment last week an take a few shots of the Alice chair wich I recently had upholstered with fabric from Margo Selby. 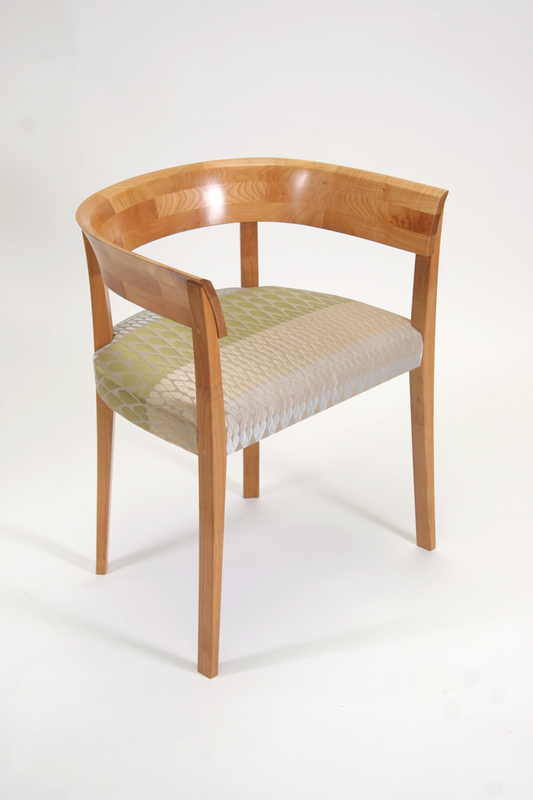 It is called ‘Vintage’ and is from her range of upholstery fabrics. 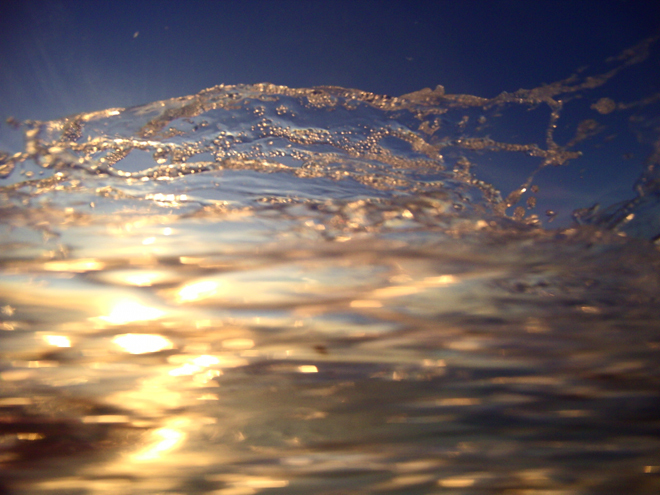 I am really pleased with the way it turned out and will be exhibiting it at my upcoming exhibitions. 26th Apr 2011 in Blog, Events. 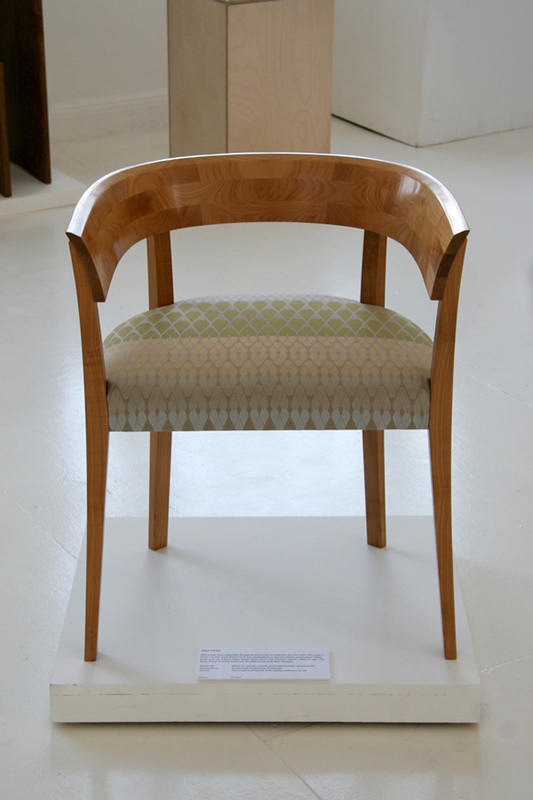 Thank You to everyone who visited our exhibition over the Easter weekend. We had a really successful show and enjoyed chatting to you all. We would also like to say a special thank you to Sandy Brown for allowing us to exhibit in her gallery amongst her paintings and ceramics. 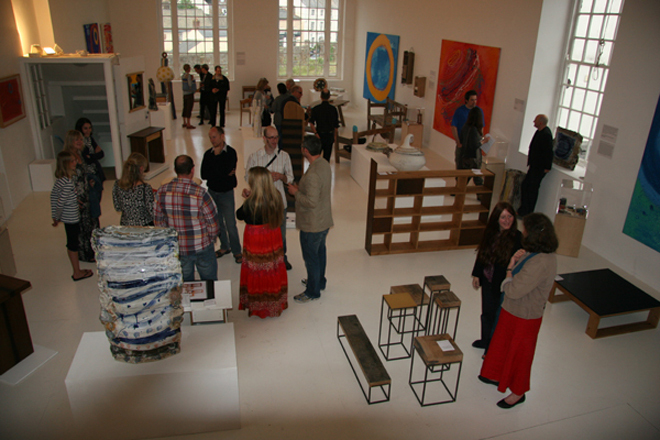 Here are a few images from the show and the private view. 19th Apr 2011 in Blog, Events. 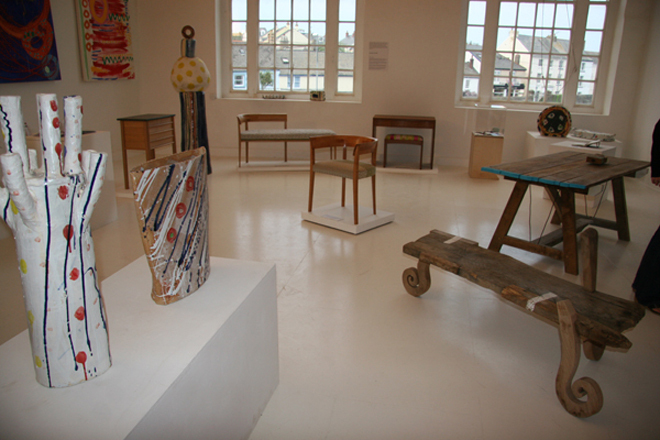 This Easter we are exhibiting our furniture at the Old Glove Factory in Appledore. For more information go to the Love Factor Website. 20th Jan 2011 in Blog, Workshop. English brown oak is a result of a Beefsteak fungus (fistulina hepatica) growing on an oak tree. The fungus reacts with the tannin in the tree changing the colour a rich brown. Needless to say this makes it rarer than standard oak and therefore a bit more pricey. I have used a few times before and it is good to be able to offer clients a rich dark timber without having to resort to importing an exotic species or using a stain. Today I visited Jack Clark in Leigh Sinton. I had stayed overnight with family in Worcester and woke up to freezing fog and a hard frost. I set of with a bit of trepidation, not looking forward to having to trying to select boards in the freezing cold. However as I drove out of the city the sun broke through and revealed a beautiful clear morning. 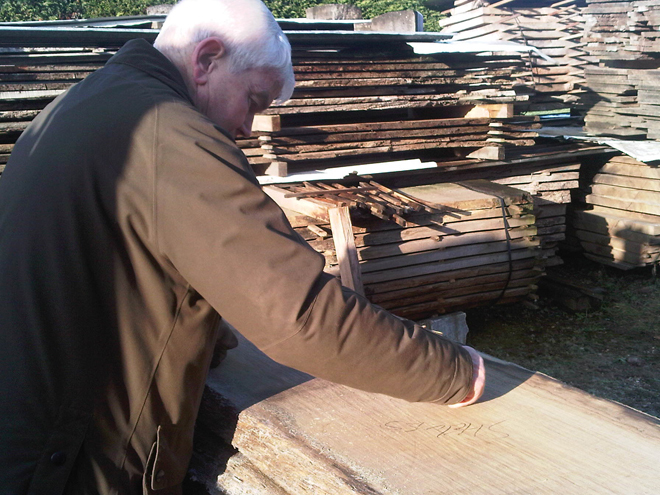 Jack has been in the timber industry one way or another since he was a young man and is one of the few suppliers who has really good quality brown oak. 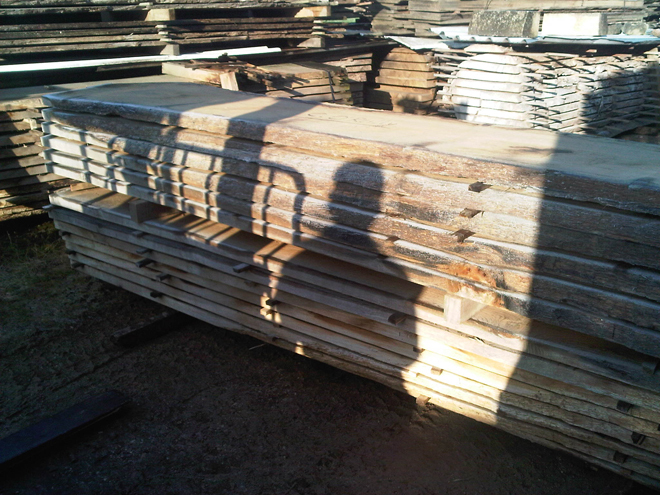 His small timber yard is full with planked trees and is a world away from the bigger yards I sometimes use. He is always happy to help me go through and select out what I want. After an hour and a half in the fresh morning air he made a proper cup of tea (tea leaves in pot) to warm us both up whilst we did the paper work. 12th Jan 2011 in Blog, Workshop. 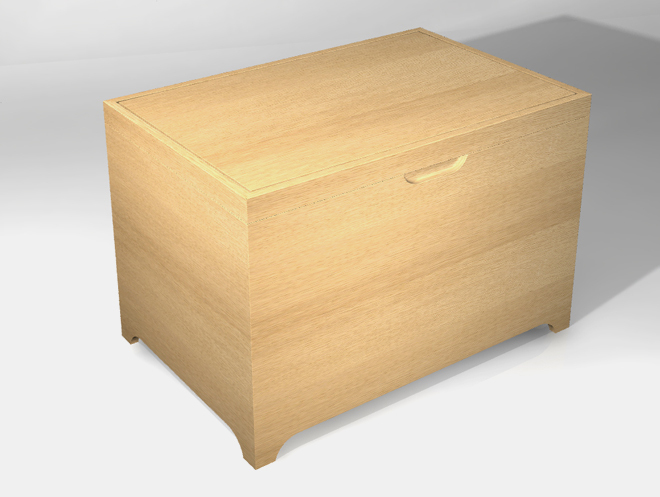 This is design for a blanket chest for a client. 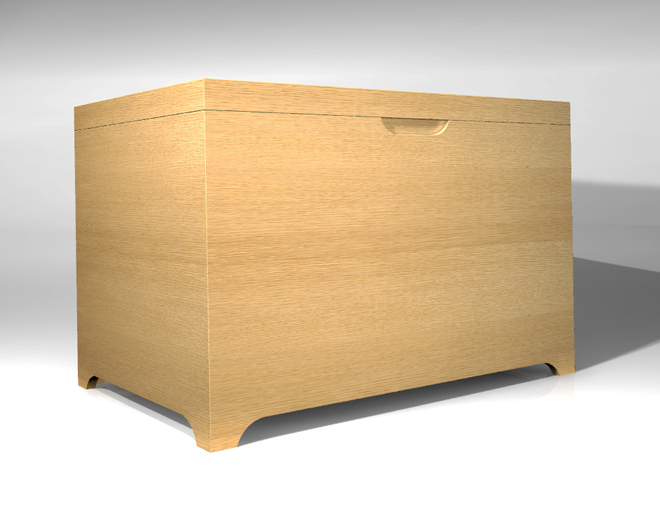 I decided to render up the image in CAD to see if it helped in comunicating the design. I’m still not sure, it is very useful but somehow it lacks some of the emotion you get from a drawing. 6th Dec 2010 in Blog, News. I have been out of action the last few weeks due to a nasty car accident on our return from Hereford Craft Fair. Luckily we are all all right apart from some bruising and whiplash. 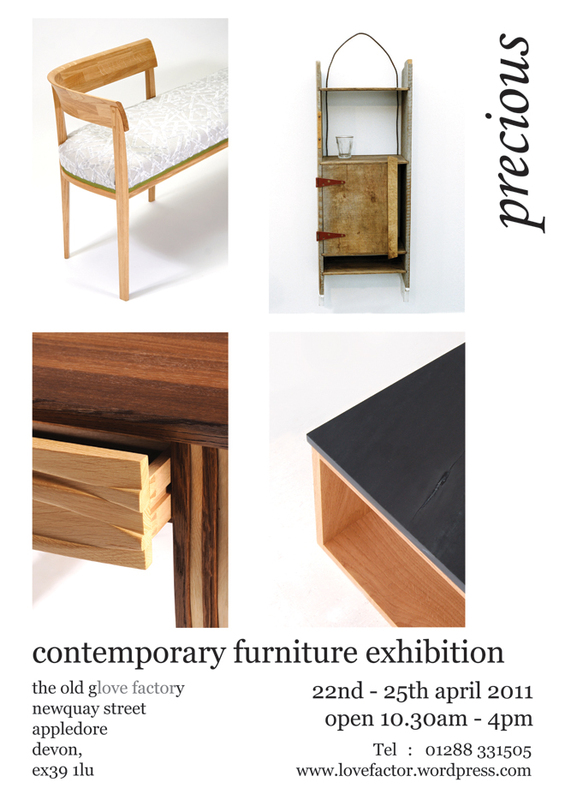 The furniture was not so lucky and all of the pieces of work I exhibited were badly damaged or destroyed. Life is slowly beginning to get back to normal and I am hoping to be able to start back at the workshop soon. 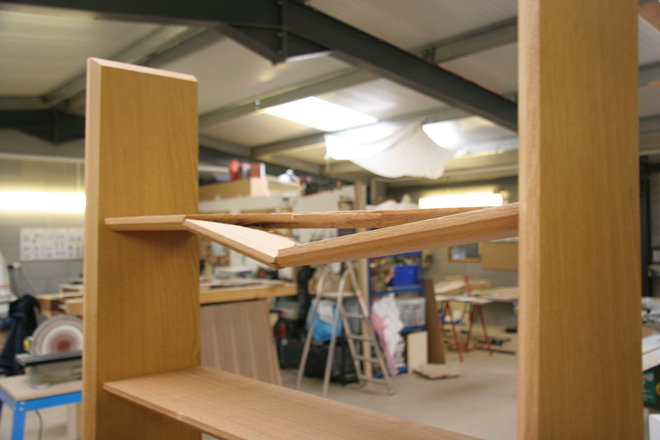 Here is an image of the set of shelves I made the week before the show. They were broken by the ratchet strap that was holding them fast in the van. 28th Oct 2010 in Blog, Workshop. 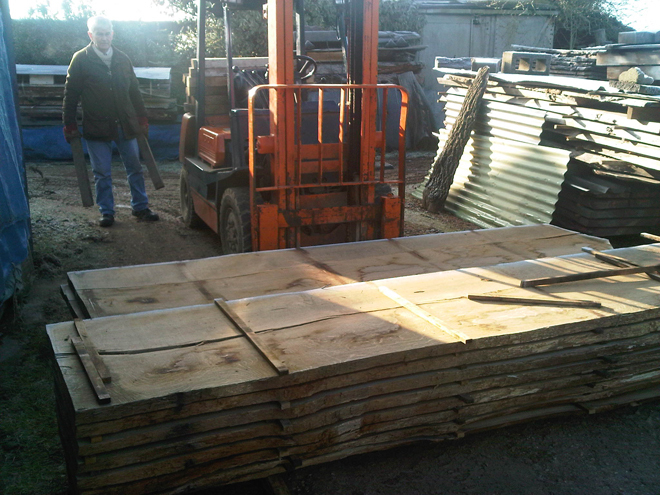 Two beautiful boards of European oak arrived in the workshop yesterday both about 6m long and 50cm wide. I have started using this more and more. 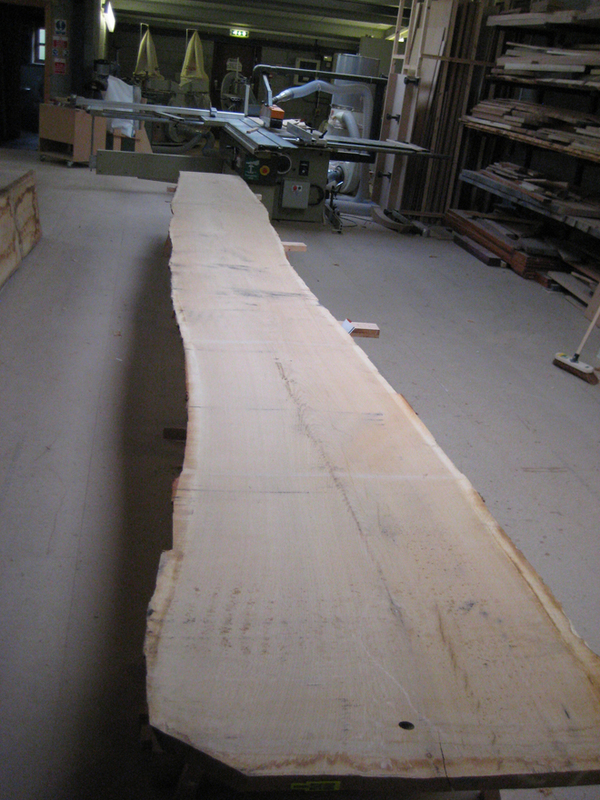 It is whats known as ‘Swiss grade’ timber FSC certified clean boards. Although more expensive, I find that not only is there is a lot less waste but as there are so few defects ( splits , knots etc..) I am able to select and cut out components much more quickly, saving costs and reducing environmental impact. 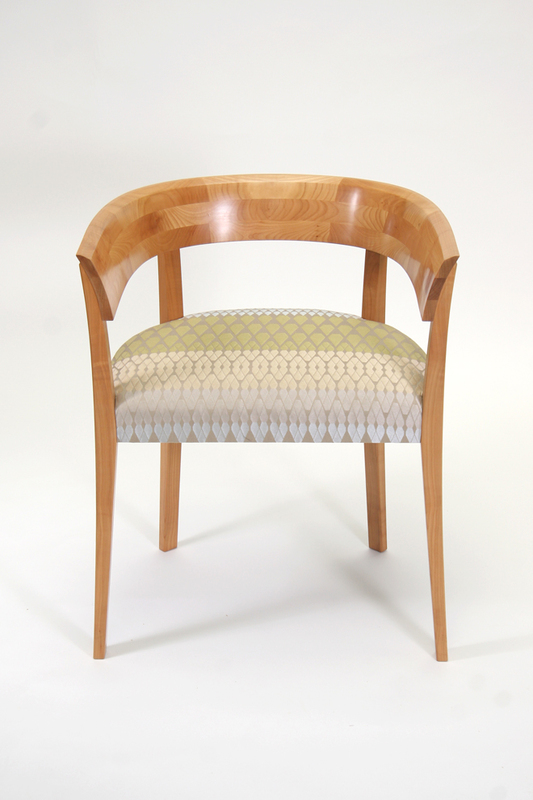 Most importantly the clean grain suits my designs. There was an article in the paper about the deforestation in Borneo this weekend. http://www.guardian.co.uk/world/2010/oct/24/borneo-indonesia-rainforest-illegal-logging The WWF website has a campaign http://www.wwf.org.uk/what_we_do/campaigning/what_wood_you_choose/ which outlines why using FSC certified timber is so important. 17th Oct 2010 in Blog, Events. 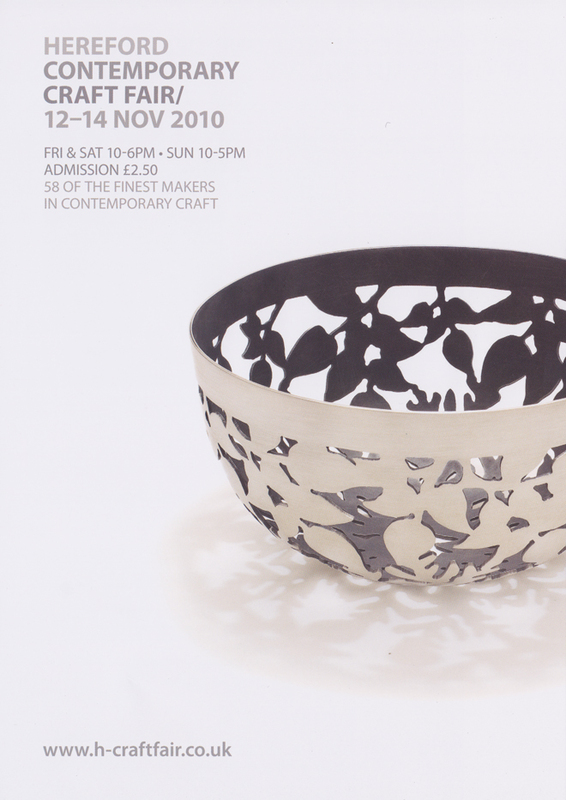 58 selected makers of contemporary craft are exhibiting over the three days at this popular fair. You will be able to choose from a stunning range of Jewellery, Textiles, Furniture, Wooden Home wares, Ceramics and Porcelain, Glass, Stone Carving, Basketry, Leather Bags, Fashion Accessories, Metalwork and Sculpture. Open 10am to 6pm on Friday and Saturday, 10am to 5pm on Sunday. The Courtyard has full disabled access and a cafe and restaurant that serve excellent, locally sourced food and drink. Entry is £2.50(free access for carers) and visitors can vote for their favourite item in the show in the Best Product Award sponsored by Herefordshire Council and Friends of Herefordshire Museums and Arts. Visitors who complete a questionnaire, will be eligible for the Free Prize Draw of £50 to spend with the exhibitor of their choice. 16th Oct 2010 in Blog, News. 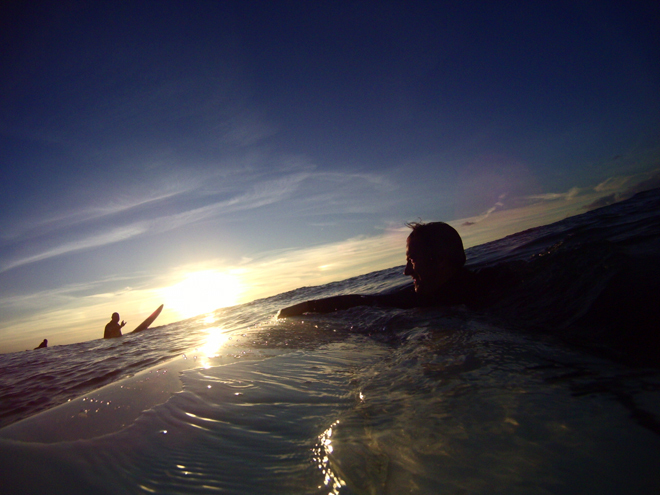 Jonathan has a camera on his surf board and kindly gave me a few shots from saturday evening’s surf. A beautiful sunset on a beautiful beach. Jonathan in the foreground me waving. 15th Oct 2010 in Blog, News. Niki had kindly allowed me to exhibit her dressing table at Origin 2010. So the day after the show we delivered it to her in Islington. 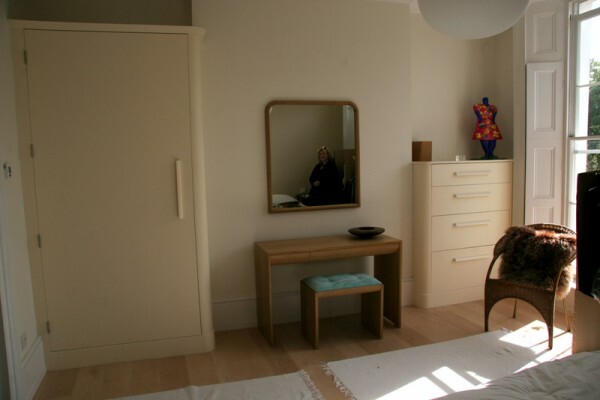 It was great to see it alongside the fitted pieces we had installed earier in the year and with the wall mirror which ties the three pieces together. 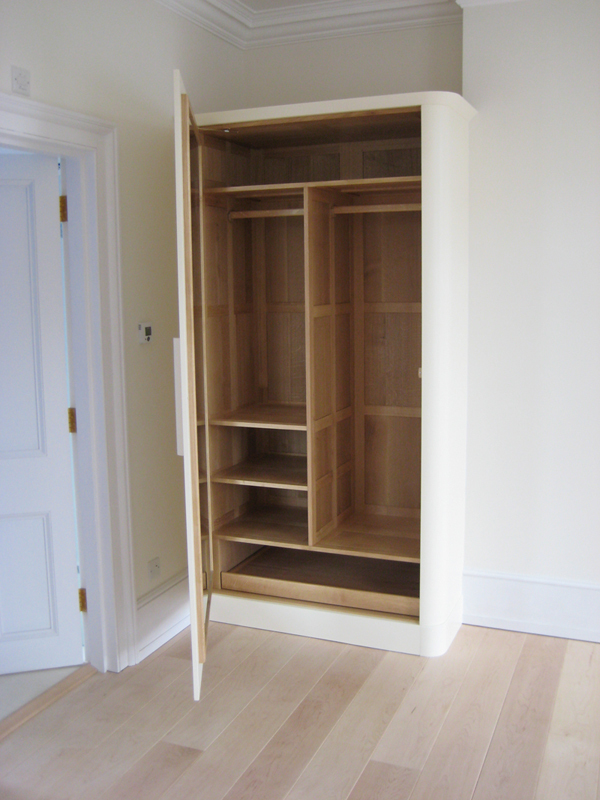 The wardrobe and the drawer unit are painted with solid oak interiors. 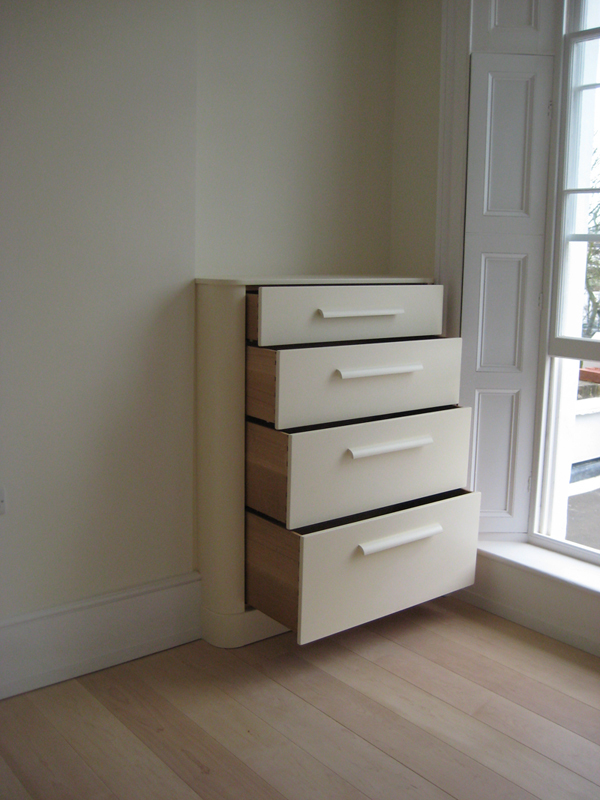 This helps them to blend into the room more and then have a real luxury feel when they are opened. 11th Oct 2010 in Blog, News. 3rd Oct 2010 in Blog, News. 17th Sep 2010 in Blog, News. 15th Sep 2010 in Blog, Events.